Tor Noroker Khobor Pelam Na Lyrics from Charitraheen Hoichoi TV Web Series. Noroker Khobor Song Lyrics in bengali written by Debaloy Bhattacharya. 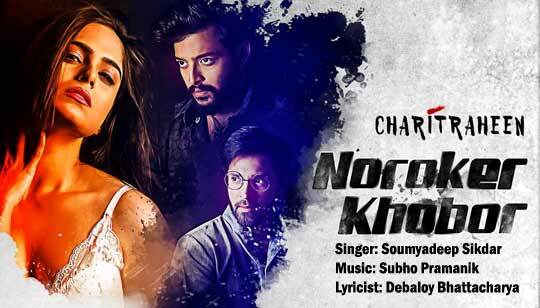 The song is sung by Soumyadeep Sikdar And Music composed by Subho Pramanik. Starring: Gourab Chatterjee, Naina Ganguly, Abhishek Singh, Ankita, Sourav Das, Sreetama, Saayoni Ghosh, Soumendra And Others. তোর নরকের খবর পেলাম না..
ভাঙবি কত, গড়বি কাকে ? তোর নরকের খবর পেলাম না ..
Bhangbi koto, gorbi kake ?